John McCain tore up the script for his Republican National Convention on Sunday, ordering the cancellation of all but essential opening-day activities as Hurricane Gustav churned toward New Orleans. "This is a time when we have to do away with our party politics and we have to act as Americans," he said as fellow Republicans converged on their convention city to nominate him for the White House. President Bush and Vice President Cheney scrapped plans to address the convention on Monday, and McCain's campaign chartered a jet to fly delegates back to their hurricane-threatened states along the Gulf Coast. Campaign manager Rick Davis said the first-night program was being cut from seven hours to two and one half. The hasty reordering of an event months in the making underscored not only the risk posed by Gustav, but also an intense desire by McCain and Republicans to avoid the political damage that Mr. Bush suffered from his widely criticized response to Hurricane Katrina three years ago. The formal business of the convention includes nominating McCain for president and Alaska Gov. Sarah Palin as his vice presidential running mate on Wednesday. McCain's acceptance speech, set for prime time on Thursday evening, is among the most critical events of the campaign for his chances of winning the White House. "If you go out on the convention floor and look around, the slogan of this convention, and the slogan of McCain's campaign, is 'Country First,'" said CBS News senior political correspondent Jeff Greenfield. "That's his whole basic argument - I put country first. Surely, by this accident of fate, McCain has a way to demonstrate what he means by postponing all the political activities here and only doing what is legally required." McCain said he was looking forward to attending the convention but did not say when he would arrive. He spoke via satellite from St. Louis after he and Palin received a briefing on hurricane preparations in Jackson, Miss. Campaign manager Davis told reporters inside the convention hall that the opening program on Monday would be "business only and will refrain from political rhetoric." To help those in need, he said, "We are working with the delegations, financial people, finance committees, many other concerned individuals to do what we can to raise money for various charities that operate in the Gulf Coast region." As for the convention schedule, he added that further adjustments would be made on a day-to-day basis. McCain said of his briefing in Mississippi: "I'm happy to report to you that the coordination and the work that's being done at all levels appears to be excellent." He cited remaining challenges in communications and search and rescue operations, but emphasized that the response seemed to be going more smoothly than the one three years ago. "I have every expectation that we will not see the mistakes of Katrina repeated," he said. "I think it speaks well of McCain," said CBS News chief Washington correspondent Bob Schieffer. "He reached out and got a hold of this thing, and made sure they are focused on what they ought to be focusing on, and that is those people down on the coast." The Bush administration's handling of that storm contributed to a plunge in the president's approval ratings that helped the Democrats win control of Congress in 2006. The uncertainty contrasted with a state of readiness inside the Xcel Center, a hockey arena transformed into a made-for-televison red-carpeted convention hall. Thousands of red, white and blue balloons nestled in netting high above the floor - to be released during final-night festivities if the Republicans decide to go ahead with them. Outside, police took nine people into custody for crossing a security barrier in an anti-war march. The nine, including two women in their 70s, were charged with trespassing, according to Doug Holtz, a St. Paul police commander. 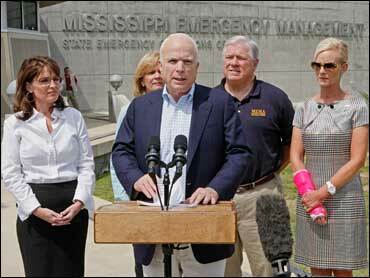 Emphasizing their concern about the hurricane, McCain and his newly named running mate traveled to Mississippi for a tour of the state's emergency management center. "I pledge that tomorrow night, and if necessary throughout our convention, we will act as Americans, not as Republicans," McCain told reporters moments later. Rudy Giuliani, the former New York mayor who is scheduled to be the convention's keynote speaker, said Sunday, "We have to make sure the focus is on the South, on Gustav, make sure that all of the resources are there, and that anything that is done with regard to the convention doesn't take anything away from that and is done in a serious way." "Senator McCain has already indicated that it would be inappropriate to have celebrations, that things have to be scaled back," Giuliani told CBS News' Face The Nation. McCain said in an interview taped on Saturday and aired on Fox News Sunday that he had conferred by phone with Barbour as well as Govs. Bobby Jindal of Louisiana, Bob Riley of Alabama and Charlie Crist of Florida. Crist wasn't coming to St. Paul, where he had had a prominent speaking role, and the others seemed unlikely as well. "I've been talking to all of them," McCain said. He said the approaching storm had already put a cloud over the convention. "It just wouldn't be appropriate to have a festive occasion while a near-tragedy or a terrible challenge is presented in the form of a natural disaster," McCain said. Still, he said, "I think that we are far, far better prepared than we were the last time." The events temporarily overshadowed a more traditionally political pre-convention debate over McCain's decision to name Palin to his ticket. She was mayor of small-town Wasilla, Alaska, for six years before she became governor in DecemDber 2006. Responding to a question after his hurricane-related remarks, McCain made a ringing defense of Palin, who Democrats argue has less experience than their presidential candidate, Barack Obama. "I thin Sen. Obama, if they want to do down that route, in all candor, she has far, far more experience than Sen. Obama does," McCain said. By contrast, he said Obama "was a community organizer when she was in elected office. He was in the state Senate and voted 130 times present. He never took on his party on anything. She took on a party and the old bulls and the old boy network and she succeeded." Palin has frequently clashed with fellow Republicans in her state, and won office after denying an incumbent GOP governor renomination to a new term in office. But Democratic Sen. Chris Dodd of Connecticut said McCain's selection was merely designed to appease the hard-right conservatives in the Republican Party. "His knees buckled" when it came time to picking a running mate, Dodd said of McCain in an appearance on CNN. McCain conferred by phone with Govs. Bobby Jindal of Louisiana, Bob Riley of Alabama and Charlie Crist of Florida during the day. Crist, with a prominent speaking role at the convention, said he was staying in his home state to tend to hurricane business, and the others were staying home as well. Democrats, too, decided to tone down their convention-week efforts. Party spokesman Brad Woodhouse said the Democrats had canceled a "More of the Same" rally that had been slated for Monday. Obama said he was ready to encourage his supporters to assist any victims of the hurricane. "I think we can activate an e-mail list of a couple of million people who want to give back," he said. Roger Villere Jr., Louisiana Republican Party chairman, said the chartered jet would fly delegates back to their home states and also fly back to Minnesota with family members who want to evacuate the Gulf Coast area. "We got a large plane because we needed it. We'll take any delegate that would like to go back," Villere said. "The McCain campaign has assured me this is the first priority," he said referring to the hurricane. With millions of Gulf Coast residents fleeing the approaching storm, Chadwick Melder, a delegate from Baton Rouge, said he was taking advantage of an offer from the campaign to fly his family out of harm's way. "I'm trying to get my family out of there and stay here for the week," said Melder, although he added, "I have responsibilities here as well."